Heat the oil in a pan and add the onions, cardamom pods and cinnamon stick. Fry over a medium-high flame for 5 minutes, or until the onions are golden. Add the chilli, ginger and garlic and cook for another minute, without allowing the garlic to burn. Stir in the cumin, coriander, chilli powder, curry powder, turmeric, vinegar and chutney, turn down the heat and cook, stirring, for two minutes. Add the sugar and water, season with pepper and simmer briskly for 8 minutes. Remove from the heat, allow to cool, then stir in the lemon juice and yoghurt. Tip the marinade into a lidded plastic or ceramic bowl, add the ribbetjies, mix well and refrigerate for 48 hours, stirring once or twice. To make the dip, combine the yoghurt, mint, coriander, garlic and lemon juice and season with salt and pepper. Cover and refrigerate. Season the ribbetjies with salt and braai over medium-hot coals for about 8 minutes on all four sides (half an hour in total), basting frequently with the leftover marinade. The coals should not be too hot, or the ribs will scorch: by the end of the cooking time, they should be a rich yellow gold, flecked here and there with sticky black bits. Serve hot with the yoghurt dip and lemon wedges. For best results, marinate the ribbetjies for two to three days; 24 hours is the absolute minimum. If you’d like a hotter marinade, add more chilli powder or chopped fresh red chillies to the marinade. Don’t rush the cooking time: lamb ribbetjies can be quite fatty, and long cooking over medium coals will help render the fat. 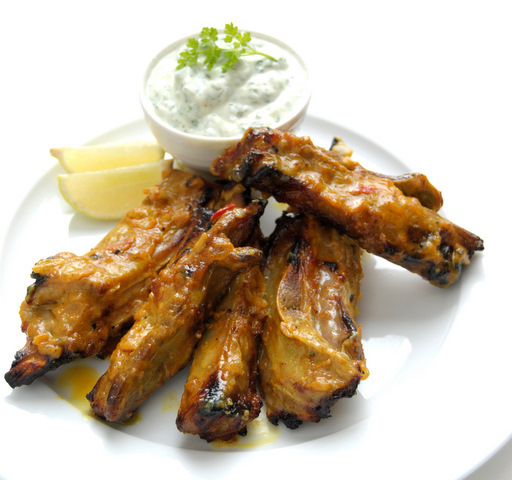 These can be successfully cooked in an oven under a very hot grill, but make sure the ribbetjies are at least 20 cm below the grill, and turn them frequently.